This week’s poll is going to the dogs…cats, elephants, cows, horses, and lions as the Café asks: What is your favorite veterinarian TV series? The nominees below include some well-known animal doctors, plus a couple of lesser-known ones who played supporting roles in short-lived shows featuring Julie Andrews and Celeste Holm. Daktari. 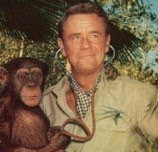 Producer Ivan Tors (Sea Hunt) created this 1966-69 CBS series starring Marshall Thompson as a vet who runs the Wameru Study Center for Animal Behaviour in Africa. He and his daughter have two pets that get plenty of screen time: Clarence, a lion, and Judy the chimp. The former starred in his own movie, Clarence, the Cross-Eyed Lion, which inspired this TV series. Daktari (which is supposed to be Swahili for “doctor”) also starred Hari Rhodes. Julie. This brief 1992 series cast Julie Andrews as the star of a fictional TV variety series who gives up show biz—temporarily, it turns out—to settle down with her veterinarian husband and two stepchildren in Iowa. James Farentino played Julie’s spouse, Dr. Sam McGuire. This sitcom lasted just six episodes…in the summer, no less. Kentucky Jones. After his big decision to leave Gunsmoke, Dennis Weaver starred in this 1964-65 series as Kenneth Yarborough (K.Y. or “Kentucky") Jones, a recently-widowed veterinarian and former horse trainer. Kentucky and his wife had applied to adopt a Chinese boy when she died suddenly. Despite initial second thoughts about being a single parent, Kentucky grows to love young Dwight Eisenhower Wong (who goes by Ike). Harry Morgan and Keye Luke co-starred. Nancy. While vacationing in Iowa (obviously a popular place for vets), the President’s daughter (Renne Jarrett) falls in love with veterinarian Dr. Adam Hudson (John Finks). Nancy’s celebrity status creates some challenges for the couple, but they get married midway through the series’ half-season run. Celeste Holm played Nancy’s chaperone; the President was heard, but never seen. All Creatures Great and Small. In 1978, the BBC adapted James Herriott’s semi-autobiographical stories about life as a rural veterinarian into a long-running TV series. Christopher Timothy played the novice vet Jim Herriott, who comes to work for the eccentric Dr. Siegfried Farnon (Robert Hardy). Peter Davison played Siegfried’s carefree brother Tristan (who role becomes larger in later seasons) and Carol Drinkwater played Helen, whom Jim meets and weds in the first season. The series ran for three seasons and was revived, without Drinkwater, in 1988 for four more years. It aired on PBS and later A&E in the U.S.
You can cast your vote in the green sidebar on the right. As always, please leave a comment if you think there’s been a serious omission. This was an easy one for me having loved "All Creatures" from the start...and not even knowing about any of the others with the exception of "Daktari." I have a feeling "Gentle Ben" and Flipper" are on the horizon! Rick, I had never heard of "Julie," "Nancy," or "Kentucky Jones" before this poll. I was very young when "Daktari" ran but I do remember the movie about Clarence. I have, however, thoroughly enjoyed "All Creatures Great and Small" so it wins by a landslide for me. I really liked Siegfried and Helen and laughed constantly over a little dog named Tricky Woo. Have to say I've never seen any of these, so I'll stay out of the voting this week. "All Creatures Great and Small"--hands down. Though I scarecely remember the series I have all the books by James Herriott.